Who are Fred and Gerry? Fred and Gerry have appeared often on television, working on CTV providing home improvement tips on early morning shows and the evening newscasts. Some of their most memorable appearances have included Ontario Television, Chum Broadcasting, "Breakfast Television" in Toronto and they were allowed access, and participated in "Fresh Air" on CBC radio Toronto. Fred, along with co-host Gerry, broadcast from the “workshop” Saturday morning from 8 till 9 on All Time Favourites AM650 a weekly open line home improvement show. Their stage presentations at Home Shows across the country have proved to be extremely successful - with a combined 70 years of expertise in the home improvement industry, flavored with humor, enthusiasm and excitement, makes for a truly professional presentation.. The good advice, humour, enthusiasm and excitement make for a truly professional show enjoyed by all. 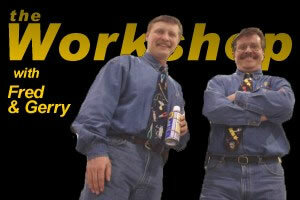 Also supported by their web site " the workshop.net" Fred and Gerry can be seen at Home Improvement and Woodworking Shows providing zany but yet factual presentations on home improvement, woodworking and renovation for your home. Fred is a Wallcovering Technician, owner of a successful wallcovering installation business for over 35 years. He has worked with some of the finest interior designers in Canada, including Sarah Richardson on projects, both commercial and residential. Fred has also appeared on HGTV Fred is past president of the Canadian Vintage Radio Society, an international society dedicated to the preservation and restoration of vintage radios and related items. Fred credits his 7 years working with respected Vancouver entertainer, the late Fran Dowie, for teaching him how to please an audience. Working with the International Belt Sander Drag Race Association, Fred MC’d media and public races from Point Roberts Washington to Washington, DC and From Ottawa, Ontario to Dallas Texas. Fred is an active member of the community, currently participating with the Richmond Lions Club and a director of the Comox Valley Classic Cruisers. Gerry heads his own marketing firm, involved in the supply of lumber and related building materials in the lower mainland. He has a solid background in the building supply and construction industry both residential and commercial. His involvement includes the manufacture and sales of concrete reinforcing products, drywall products and industrial manufactured steel products, softwood, hardwood lumber products. Gerry has extensive experience in the hardwood and softwood segments of the lumber industry, which has included manufacturing, wholesale and was the owner of a retail building supply store for many years. Gerry has been an active member of the communities in which he has resided, with participation in the Boy Scouts of Canada, B.C. Youth Soccer, Chamber of Commerce, past director of The Canadian Vintage Radio Society, a world wide club dedicated to the preservation and restoration of vintage radios and related items. It’s been rumoured, Gerry has stepped out of the closest, and on occasion is called a novice “Gear Head”, obviously trying to regain his youth or just stepping back in time, hot rodding cars that should be left alone.